We've entered the second course of the Titanic 1st class menu; Soups! Our first soup is a lovely French country favourite, Cream of Barley. I was surprised by this hearty choice but once I tried it I discovered it had a wonderfully comforting and elegant flavour. This is one of those soups that taste even better the next day. Be aware that if you are not serving this soup right away, the barley will continue to absorb liquid as it sits, so add some extra stock or water to thin it out and adjust the salt & pepper accordingly. Enjoy! 1. In large pot, heat oil over medium heat, add salt pork and cook, stirring often, for two minutes. Stir in carrots, onions and garlic; cover and cook, stirring occasionally, for 10 minutes or until vegetables are very soft. 2. Meanwhile, wrap bay leaf, parsley stems and peppercorns in cheesecloth, fold over and tie to make bouquet garni. Stir barley into vegetable mixture, cook, stirring, for about 45 seconds. Pour in stock and add bouquet garni. 3. Bring to boil. Reduce heat to low and simmer, covered, for 40 to 45 minutes or until barley is tender. 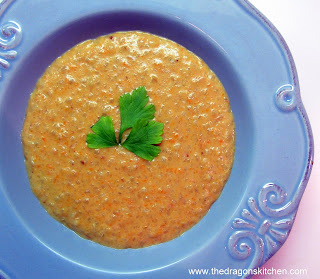 Remove from heat; in blender or food processor, puree soup in batches until almost smooth but still a little chunky. Transfer to clean pot, cook over medium heat until steaming. Whisk in cream, whiskey and vinegar. 4. Season with salt and pepper to taste. Do not boil. A surprising choice for an elegant dinner but it works! Those hers new what they were doing. Basically the same ingredients for a beef balrley soup but blitzed in a processor....still world world and elegant. Question, what is meant by whiskey? Bourbon, Rye, Irish. The Scottish version is whisky.